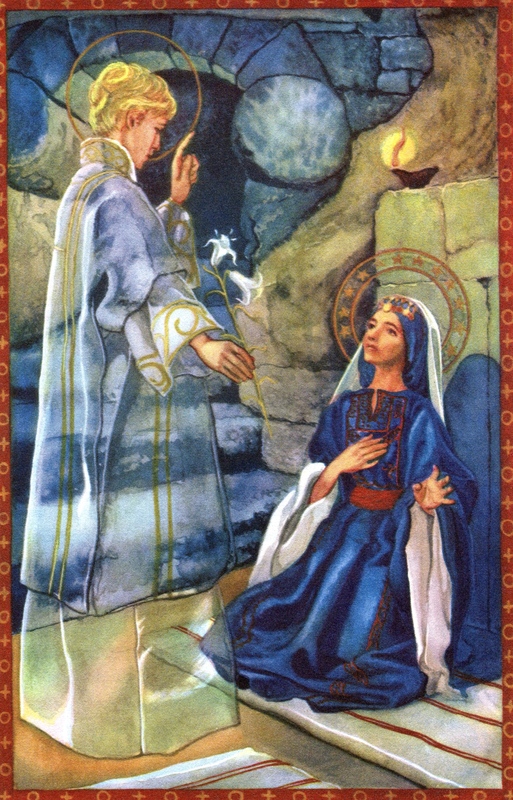 Today we celebrate the great feast of the Annunciation, when the angel Gabriel appeared to the young woman Miryam to discuss God’s plan that she become the mother of the Christ of God. The focus of many great homilies, such as my buddy Deacon Greg Kandra’s wonderful homily “How Can This Be”? , is justifiably on that young Jewish woman Miryam, Mary. We watch as Mary, full of fear, courageously gives her “yes” to God, taking on whatever God has in store for her and her family in the future. I was blessed to be ordained a deacon on the Feast of the Annunciation twenty-four years ago today, and over the years, I’ve come to appreciate the fact that we need to spend time with BOTH Mary and Gabriel. Gabriel is so much more than God’s mouthpiece, a divine voice mail announcing a fait accompli to Mary! Let me sort this out, a reflection on diaconal ordination in light of the Annunciation. 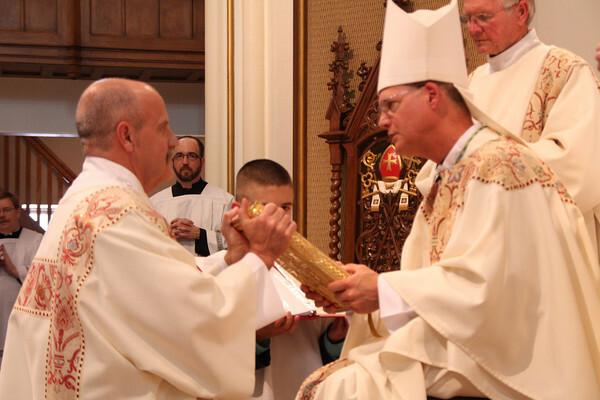 During the ordination of a deacon, the bishop places the Book of the Gospels into the new deacons hands: it’s the first task of the new deacon, and the first charge given to the deacon by his bishop: “Receive the Gospel of Christ, whose herald you now are: Believe what you read, teach what you believe, and practice what you teach!” I heard those words directed to me on 25 March 1990 by my archbishop, Cardinal James Hickey of the Archdiocese of Washington, DC. We had heard the Gospel of the Annunciation just moments before, and now the Cardinal was telling me that I was supposed to be a Herald of Christ! 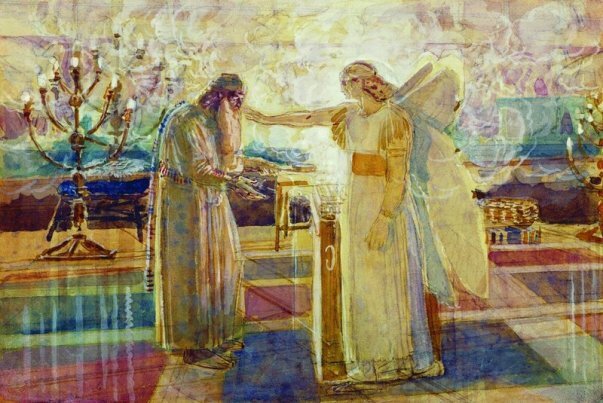 Immediately, I sensed a kind of kinship with the herald in the Gospel: Gabriel. Consider Gabriel’s role. In the Hebrew scriptures, for example, he interprets the dreams of Daniel. He is the messenger who goes to Zecharias, the father of John the Baptist. Again, he not only “announces” things; he explains them and acts on them as well. And then we have the appearance of Gabriel to Mary. Once more, he does not simply announce God’s plan and fly away; he helps Mary, who is justifiably uncertain and questioning: “How can this be?” And he explains to her. The heralds of God are not merely proclaimers of the Word only; they are supposed to be ministers of the Word, helping others to understand and respond in faith. For those of us who serve as Deacons, that’s the foundation of the charge we’re given at ordination: not simply to proclaim the Word and leave, but to proclaim the Word, believing completely the message of God, and then teaching and practicing that Word in our own lives of service. Mary’s fiat came from her own graced relationship with God, but it was also aided through the ministry of the herald, from who she received not only the Word, but encouragement and support, an angelic model of the very relationship she was being called to herself. To make Christ present in the world demands more than mere words; it demands real world faith, courage, and commitment. Mary’s fiat and Gabriel’s fiat go together. 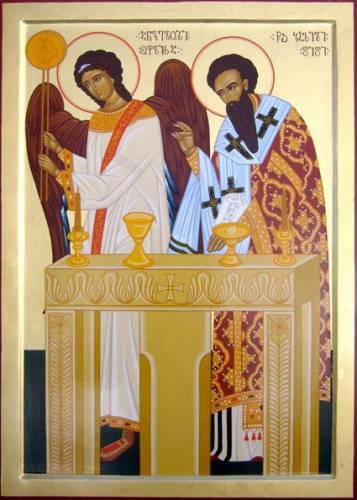 Perhaps this is why there is such a longstanding tradition, especially in the Eastern traditions of the Church, to associate the ministry of the Deacon with the ministry of angels: saintly angelic heroes like Gabriel are frequently depicted as angels, and angels — those heralds of God — are frequently depicted in the vestments of the deacon. So, as we reflect on the fiat of Mary, may we also ponder the role of Gabriel, the Herald.